August is a keyless smart lock that you can attach to any door in your home but is best used on your front door. August uses Bluetooth technology from your smartphone to recognise when you are near your door and unlocks it. You have 24/7 total control of who enters and exits your home by adding family and friends to the access list. Log records are kept for you to track who and when enters/exits your home. August requires 4 x AA batteries and you can simply install it to your existing deadbolt lock. This is a great way to keep your home secure. No more forgotten keys! The Nest Thermostat is a clever thermostat that learns about you and how warm or cool you want your home. You can simply change the temperature by turning the dial, but you can also programme the timing and temperature when you are out using the smartphone app. 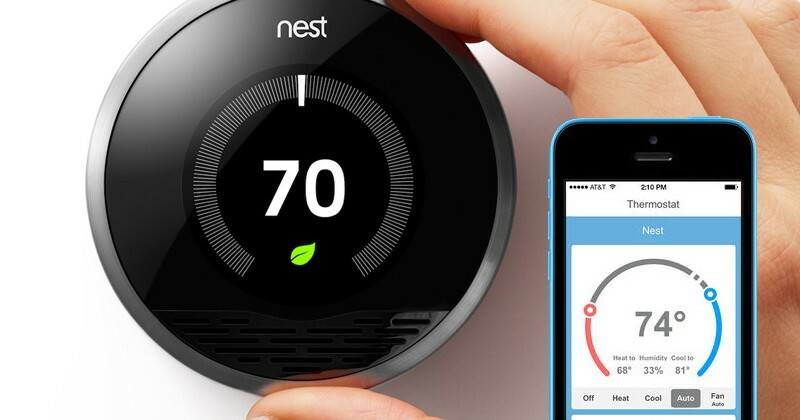 Nest Thermostat learns when you are not home and turns to Away mode and switches off your heating to save you money. You can have different temperatures for different times of the day like when you wake up or when you are returning home from work. This is a hot thermostat (see what I did there?!) that will help make your home the temperature you want, when you want. The SkyBell WiFi Doorbell is a smart video doorbell that uses the built-in camera and microphone to enable you to speak, hear and see the person at your door whether you are at home, on the go or at work. SkyBell uses the motion sensor to alert you when someone is nearby. Using your smartphone the live video feed begins giving you a real time video call with the visitor at the door. If you are at home you can let them in just by tapping on your smartphone, or if you are away you can let them know when you’ll be back home or even let them in. This is a great security gadget that gives you comfort of who enters your home.